On April 15, 2010, Somax Performance Institute (somaxsports.com) published a videoanalysis of Tiger's swing and predicted he would develop the yips ( https://www.youtube.com/watch?v=52-l9ZW60dk ). Tiger's current problems with the yips are described in today's Wall Street Journal. Unfortunately, in the article, Tiger's yips are ascribed to mental causes. Somax was able to predict Tiger's yips four years ago by analyzing and measuring the swing of prior great golfers whose careers were ended by the yips--Sam Snead, Ben Hogan and Lee Trevino. What Somax president Bob Prichard found was that all four golfers (Tiger included) restrained their driver on their downswing prior to impact by overusing their forearm muscles. In other words, the cause of the yips is physical--not mental. Golfers like Jack Nicklaus, who did not restrain their driver and allowed centrifugal force to pull their arms and club shaft into a straight line, did not develop the yips. Instead of fighting the physics of the golf swing, Nicklaus and golfers like him wisely went 'with the Force'. 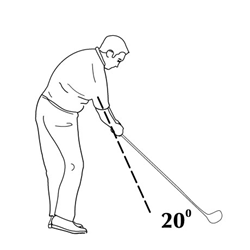 Prior to impact, the club head is traveling over 100 mph and pulling away from the golfer with 100 lbs. of force. This is the same amount of force you would experience trying to lift a 100 lb. sack of cement. 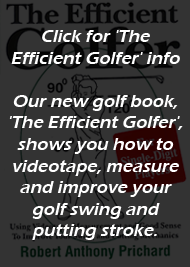 The problem is that the pull of the driver is so brief that most golfers are unaware of the magnitude of this force. All four golfers dropped their hands at address and then restrained their driver at impact in an attempt to return the club to the same position it was at address. While this helped improve their accuracy, it came with an unwanted side effect--the eventual development of the yips. In order to restrain their driver, these four golfers had to hyper-contract the muscles of their forearms. Doing this while hitting dozens of balls every day and playing hundreds tournaments over the years tore a number of the 20,000 individual muscle fibers in each forearm muscle. This in turn led to the formation of microfibers (mild scar tissue) in and around the forearm muscles as part of the healing process. As these microfibers accumulated over time, the forearm muscles became stiffer and the repeated hyper-contraction led to chronic tension. Then, when the golfer had to lightly grip his putter or chipping wedge, his overly-tense forearm muscles habitually spasmed prior to impact--just as they had thousands of times with the driver--and the golfer yipped his putts or chips. 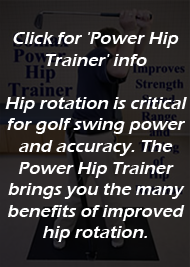 This is why a treatment for the yips is to use the claw grip on the putter so that the golfer is not using the same muscles as he does for the driver. Somax releases microfibers with its Microfiber Reduction program and releases tension with its Tension Reduction program. Both are available at its headquarters in Tiburon, CA, 10 minutes north of San Francisco. and Are You Flexible Enough for Golf?